Falls and fear of falling are a major challenge to living independently. 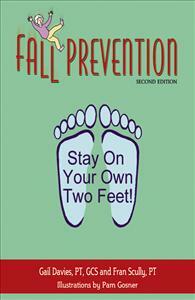 Fall Prevention: Stay On Your Own Two Feet! tells you how to identify and reduce your fall risk factors. Topics covered include; fear of falling, posture, balance, strength, exercise, vision, medications, footwear,clothing, doctor relationship, pets. Easy to follow illustrations, simple lists, and proactive exercise suggestions make this quide a one stop shop for elders and caregivers. Second edition contains updated references, resources and checklists. I am determined to stay on my own two feet as I age. So when I received Gail Davies and Fran Scully's informative and easy to read book, I turned first to the section on staying strong and flexible. The exercises are effective and easy to work into a daily routine. I have added the 'chin tuck' to help keep my posture straight and those that will improve my balance. With this book as a handy guide I will grow old gracefully!